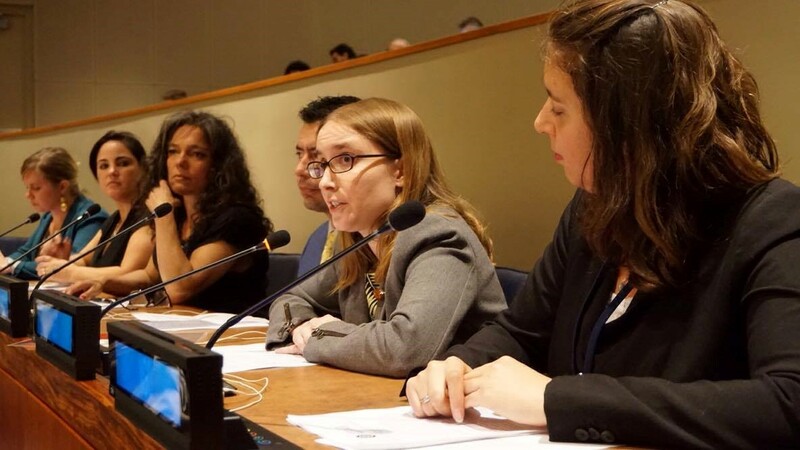 Elizabeth Minor representing Article 36 during the First Committee of the UN General Assembly. Article 36 is a UK-based non-profit organisation doing research, policy and advocacy to address the humanitarian impact of weapons and methods of warfare. In an interview with Elizabeth Minor from Article 36, we asked about the organization’s experience with working on the issue of armed drones. Elizabeth is an Advisor for Article 36. She was previously a researcher at Every Casualty and Oxford Research Group, where she investigated the practices and methods used by states, international and civil society organisations to document the casualties of violence and armed conflicts. How did your organization get involved with the issue of armed drones and why is this important for your organization objectives? Article 36 is a specialist non-profit organization focused on reducing humanitarian harm from weapons – so we come at the issue of armed drones through looking at the risks posed by the emergence of drone technologies in the use of force, and how the harm caused in communities by their use can be addressed. We focus on collaborating with other civil society partners and with governments to develop new international policies and legal standards that can help prevent civilian harm and protect rights from existing and emerging weapons technologies. New military drone technologies started being used without adequate international scrutiny of what their role in the use of force should be – if any. This has led to a situation in which the suffering of communities and the rights of drone victims have been left unaddressed. Now, countries should come together internationally to articulate clear common standards. Because some states are trying to change the meaning of core international legal concepts through their use of armed drones, we need to get much more specific about what the international community considers the limits of acceptable use to be. What would count as a success in your work on drones for your organization? What is the impact you hope to achieve in the coming five years? We are aiming to help to lay the groundwork for a multilateral conversation on the role drones should play in the use of force. We are doing this through working with a diverse range of states, international organizations and civil society with the objective of developing buy-in and cultivating leadership for such a process, and through helping to develop policy thinking amongst stakeholders. Over the next five years we would be hoping to see increased attention to and prioritization of this issue by states in international forums and to see a process develop, and we would be aiming to contribute to that. We think it is very important to extend the conversation beyond Europe and North America, as we believe this issue is a concern for all countries, whether they are users and producers of drones or not. If you had one chance to educate/influence your Minister of Defense and/or Minister of Foreign Affairs on the deployment of armed drones, what would you do? I think I would ask them to consider the really grave risk that international legal frameworks could be eroded through certain uses of drones. They should think very carefully about how UK policy on drones can strengthen rather than undermine the international rules-based system – which is after all a foreign policy priority for the government. Most importantly, I would ask them to listen to the stories and to understand the experiences of people in communities who have been living under armed drone patrols and airstrikes. The use of drones by some countries has led to death, injury and destruction, and disruption to normal life and work from the constant fear of strikes. This has long-term consequences for normal people and families living in affected areas. Drone-users like the UK should shift their focus from a counter-terrorism lens on to these humanitarian impacts of drones. How do you experience working on this issue in the UK? What is your take on the transparency situation of the UK government, regarding the use of armed drones and/or complicity? We appreciate the openness to dialogue and discussion that UK officials have shown to us. Along with other organizations though, we are deeply troubled by various aspects of current policy – such as the cooperation with the US drone program that Amnesty and Reprieve have documented – and by the lack of clarity over what UK policy, practices and legal interpretations with respect to armed drones are. In our work at the international level, the UK often takes a position that existing law is adequate to deal with specific issues that arise from the use of different weapons systems, and there is a resistance to new initiatives that can bring clarity or stronger standards. I think there is a need for a more honest conversation about the specific risks posed by armed drone technologies and the patterns of use they lend themselves to, and how the international community can manage these.